With influences from the MacLean Wheel, Philip Hills Bar chart and David Wisharts Profile table I have compiled a structure analysis chart not only to my own benefit but also for the purpose to demonstrate notes taken during the analytic phase. 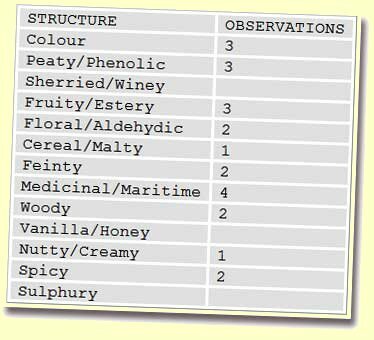 A structure analysis chart or personal ‘observation’ chart is provided in conjunction with each descriptive taste note, throughout this publication. The chart serves as a foundation for the descriptive phase and is the key to the verbal elaboration. Each chart element is ascribed a weight ranging from 0 to 5, except the colour. The weights represents 0 for not present, 1 for a vague, 2 for low, 3 for medium, 4 for pronounced and 5 for dominating notes. For the colour, the range is from 0 to 20 in steps of 1, where clear as water is set to 0 and dark as molasses is set to 20. The spectrum includes shades of light yellow to dark brown. The values assessed are not intended to be summarized and serving as a score for the whiskies. Peaty/Phenolic/Smokey – Are not flavours from water that flows through peat bogs but where peat and coke is used in the kilning process. (Flavour range is light to pungent and from mossy, earthy, peaty, phenolic notes to bonfires, burnt heather and arson). Sherried/Winey – Flavours from a cask’s previous content. Fruity/Estery – Estery flavours of fruity types are formed by acid reactions during the fermentation and maturation. Floral/Aldehydic – Estery flavours of floral types are formed by acid reactions during the fermentation and maturation too, but also by aldehydes. The aldhydes forms when alcohol is exposed to air and during distillation in pot stills. (Flavour is aromatic and fragrant. Range is from leafy, sappy, new cut grass, hay, heather and herbal to greenhouse and summer meadows. Mint, violets and honeysuckle are other descriptors). Cereal/Malty – Characteristics of the malted barley carried over from fermentation. Feinty – Also known as tails or after-shots. It is the final spirit from the spirit still the end of distillation. The feints are low in alcohol, and the major part is returned for re-distillation. Feints are formed during the distillation as well as the maturation phase. In small proportion they are the essential elements in the flavour of a whisky. If present above a moderate level it makes the whisky improper and undesirable. (Flavour range is from Hessian cloth and ageing books to leather and leather goods like car seats and saddles. Medicinal/Maritime – The maritime, the ‘salty’ notes are often said to be the result of maturing whisky in appropriate micro climatic conditions. Perhaps this may be a contributing factor but these notes, medicinal and maritime are in general developed by the fermentation and distillation process. The salt level found in whisky is not organoleptic detectable; however, it is not inappropriate to describe a sensory sensation as ‘salty’ even in the absence of such substance. (Flavour range is from brine, sea foam, sea weed to salt and iodine but also turpentine carbolic acid). Woody – Oaky aromas, bitter tannins and astringent mouth feel are derived from the oak container. The tannins are related to time and the number of times the container have been used and contribute in moderate amount to the balance. Longer maturation extracts more tannin but contrary to wine the tannins are not markers of quality. Excess tannins may show that the whisky acquired age but overshadows its attributes. A bitterness, not sweetness, may also occur from excess use of the only permitted additive, the spirit caramel (E150). Vanilla/Honey – Vanilla and honey flavours stems from the oak species used for the oak building up the maturing vessels. Nutty/Creamy – The nutty flavours are built up in well matured whiskies and generally related to whisky of higher quality. Spicy – The spicy flavours are extracted from the oak vessel, especially new ones, during the maturation phase. Pine-resin like notes is occasionally found as a flavour from new oak wood. (Flavour range is from ginger, nutmeg cloves to cinnamon and pepper, but also cedar, sandalwood and pine). Sulphury – The different copper parts of a pot still participate as a catalytic element during the various distillation steps.